There isn’t much that’s more confusing for a 21st century genealogist than dealing with the names our ancestors gave to certain types of legal actions hundreds of years ago. And of all the types of legal actions that existed in the past, one of the most confusing is the action called trespass. 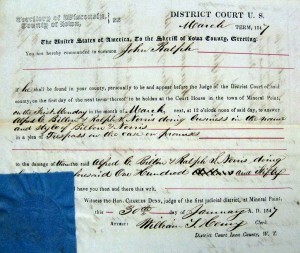 So it’s no wonder that reader Barbara Schenck was puzzled when she came across a file from the Wisconsin Territory in which Alfred Billon and Ralph Norris, merchants doing business as Billon & Norris, sued John Ralph “in a plea of Trespass on the case on promises.”1 What, she wondered, did John Ralph do to get himself named in a suit like that? Now the first problem the documents presented was deciphering just what the plaintiff said the cause of action was. 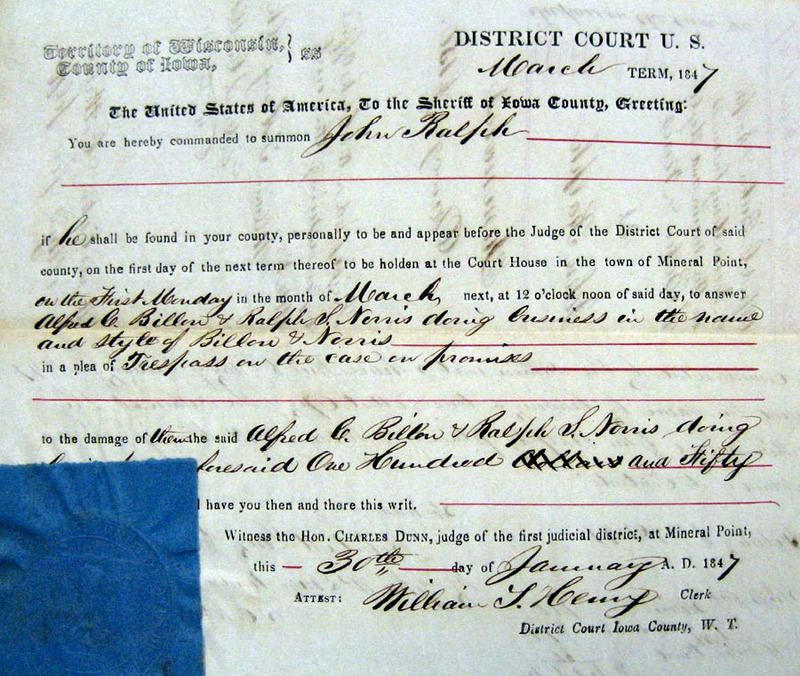 It sure looked like the document read “in a plea of Trespass on the case on premises.” Since the usual meaning of trespass in ordinary conversation involves some type of wrongful entry on land,2 at first glance it could easily seem that the case must have centered on real property of some kind. So why was it a trespass, and what’s this business about case and promises anyway? Why wasn’t this simply an action for debt? Basically, civil actions were broken down into two broad categories: those involving breach of contract and those involving some other civil wrong, called a tort.6 Each of those categories was subdivided, and subdivided again and again, until every lawsuit had to fit — or be forced to fit — into a narrow pigeonhole. • I’ve got a truck full of logs, one of the logs rolls off the truck and knocks down your fence. That’s a direct injury so it’s trespass. But if the logs roll into the street and you come along later and trip over them, that’s trespass on the case. • You board your horse in my stable. I wander out there one night and beat the horse with a stick. That’s trespass. But if you hire me to shoe the horse, and I do it badly, and the horse is injured, that’s trespass on the case. • I run my railroad locomotive into your car at a train station. That’s trespass. But if sparks come out of the locomotive’s smokestack and set your house on fire, that’s trespass on the case. All well and good. But what’s with this promises thing? How come that’s not an action for debt? Or on a contract? Well, you remember those technical pleading rules? The pigeon holes cases had to fit into, or be forced into? This was a forced-into job. The promissory note doesn’t have all the elements for an action for debt based on a contract. The note wasn’t witnessed, wasn’t under seal, and didn’t spell out what would happen if it wasn’t paid on time. Initially, these sorts of claims were forced into the “trespass on the case” pigeonhole. Then that pigeonhole was more accurately described as “trespass on the case on promises,” since at its heart it was the broken promise that caused the lawsuit. Eventually this sort of case ended up being called “assumpsit.”9 It was basically an action for the recovery of damages for the non-performance of a simple contract — oral or written. And it differed from debt because the amount could be uncertain and a jury award could include the value of the note, interest, and any additional damages that the plaintiff sustained. But that was for another and later day. For John Ralph, this was — sorry, I can’t resist — a trespass that wasn’t forgiven. Thank you, Judy. I don’t think your first citation exactly conforms to EE, though! Elizabeth Shown Mills always says citation form is as much of an art as a science, and that citation is artistic license!! I always read your blog with all the references, Judy – had to laugh at the first reference! Happy birthday to Barbara Schenck, indeed! Another fascinating and slightly convoluted legal issue. Cheers. I sure wasn’t going to let the day go by without mentioning the birthday!! !